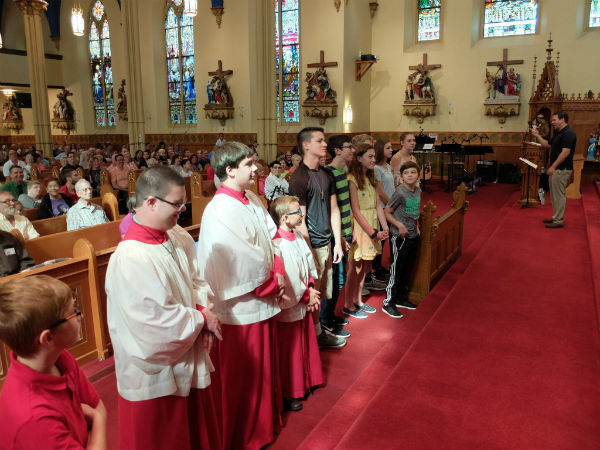 The Vocation Office of the Diocese of Erie and Erie’s Serra Club have recognized the hard work of many altar servers from seven different Catholic parishes in the Erie area. 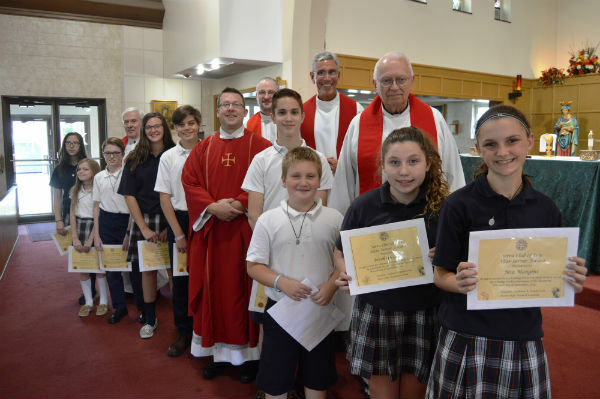 The girls and boys who serve the parishes of St. Joseph/Bread of Life, St. Stanislaus, Holy Trinity, Our Lady of Mount Carmel, St. Boniface, St. James, and St. Peter Cathedral parishes were honored with medals and certificates at the St. James School Mass on September 14. Altar servers were also recognized at all the weekend Masses at St. Joseph Church/Bread of Life Community on September 15-16. Father Michael Polinek, diocesan vocations director, presented the awards along with representatives of the Serra Club, an organization devoted to the support of religious vocations, along with parish priests. Each server received a medal of St. John Berchmans, the patron saint of altar servers.